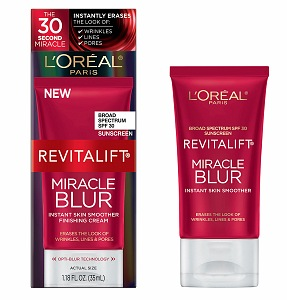 L’Oréal Paris introduced the phenomenon of instant blurring effects to the masses with the launch of Revitalift Miracle Blur Instant Skin Smoother Finishing Cream in early 2013. Now, the brand broadens the Miracle Blur portfolio to provide a solution for approximately 50% of consumers who claim to have oily/combination skin types. Like the original, Revitalift Miracle Blur Oil-Free ($24.99) helps erase the look of fine lines, wrinkles and pores for a virtually flawless-looking skin in 30 seconds—but this new formula is ideal for those who seek an oil-free option for achieving instant skin gratification. The oil-free, non-SPF formula is formulated with silica, a mineral known for its oil-absorbing properties, and has an innovative texture that blends seamlessly into skin for a clean, silky-smooth finish.